Conservative MPs will launch a campaign on Monday to force Tony Blair to reveal how much he earns and who pays him. Tory MP Andrew Bridgen is tabling an Early Day Motion (EDM) in the House of Commons, demanding that former prime ministers be bound by the same rules of transparency and oversight as serving politicians. While the EDM is unlikely to be passed by parliament, it follows growing concern over Blair’s work for authoritarian governments and controversial corporations. Blair’s business transactions have been linked to the governments of Saudi Arabia, Azerbaijan and Kazakhstan – all three of which are widely known for their human rights abuses. 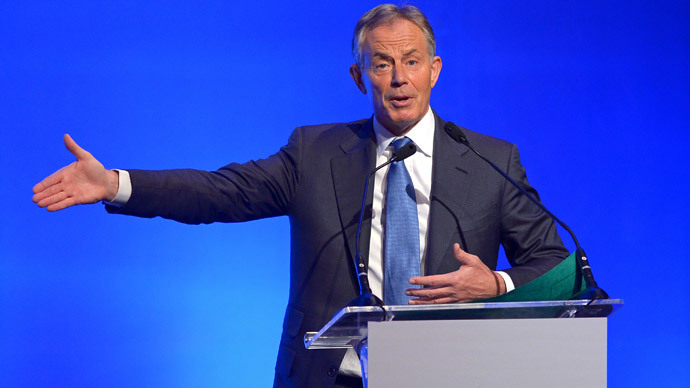 “Tony Blair has embarked on a career of personal enrichment and has blurred the lines between his public and private interests,” Bridgen told The Sunday Times. “No other former prime minister has gone to work for other sovereign states. Mr Blair is still in public life, but is not bound by its principles, and that needs to be changed,” he added. Blair, who was last year awarded GQ’s Philanthropy Award, has come under intense scrutiny as he has been linked to a string of authoritarian regimes and less-than-ethical companies. A consortium of energy companies, including BP, hired him last year to work on a new gas pipeline which will go from Azerbaijan to Italy via Turkey. The project has come under fierce criticism for the environment destruction it may cause and for the wealth it will give Azerjaijan’s controversial leader, Ilham Aliyev. Aliyev, whose government has imprisoned bloggers and journalists, was compared to a mafia don from The Godfather by US diplomats in a Wikileaks cable published in 2010. The former prime minister’s consultancy, Tony Blair Associates, reportedly earns £7 million a year for advising Kazakhstan’s strongman president, Nursultan Nazarbayev. Nazarbayev’s government has been accused of human rights abuses after its courts forcibly closed much of the country’s independent media and his troops massacred dozens of striking oil workers at a peaceful protest in Zhanaozen, in western Kazakhstan, in December 2011. As if the list of unscrupulous customers wasn’t long enough already, Tony Blair Associates has also been linked to a Saudi Arabian oil company founded by the son of Saudi Arabia’s King Abdullah. A leaked contract, which emerged last November, showed that Blair had been hired by PetroSaudi to help facilitate a deal between the oil firm and Chinese state officials. Blair, who also serves as a Special Envoy for the Middle East Quartet, was reportedly paid £41,000 a month to carry out these duties, and took a 2 percent cut from each successfully orchestrated deal. Since leaving office in 2007, Blair has amassed millions of pounds in fees collected through his consultancy firm. Some have speculated that the former prime minister’s personal fortune could amount to £100 million, but he has implied it is closer to £20 million. This figure will raise eyebrows, however, as it is reported his personal expenses run into the millions. Blair’s private jet alone is worth £30 million and reportedly costs £7,000 for every hour it is in the air. Since leaving government Blair has also claimed a taxpayer-funded allowance for ex-prime ministers, in addition to other state subsidies. A Freedom of Information request in 2012 revealed Blair was costing the taxpayer £400,000 a year in pensions, public duties allowances and security costs.